There are more contrails now than there were 20 or 30 years ago because there are a lot more flights now. But it’s not entirely that simple. As well as more frequent flights, there are more routes. Areas that almost never saw a contrail would suddenly start seeing them on a regular basis when a new route opened up between two cities. Say Denver, CO and Medford, OR. In 1990 there were no direct flights between Denver and Medford, so you’d have to fly from Denver to San Francisco, and then SF to Medford. Then an airline opens up a new route, and suddenly some towns on the line between Denver and Medford start seeing contrails. The map is from an unusual perspective, viewing the globe from overhead of Europe, so the US is above and to the left of the center. 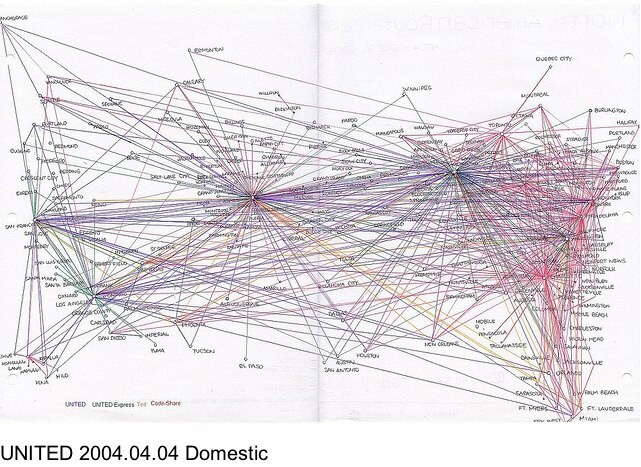 It does not show all the flights in the world, seeming to concentrate on those that connect in some way to Paris, but it does illustrate the huge increase in air routes that is reflected across all airlines. See how sparse the US is in 1980, and how crisscrossed it is in 2008. 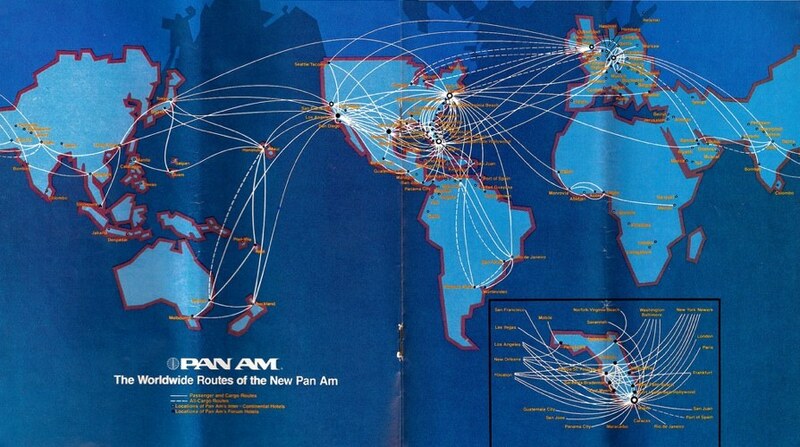 Similarly, look at Pan Am’s 1980 route map. Even in just 11 years, several new routes have opened up, and more areas of the country are covered by those routes. So you can see that the increase in the total amount of flights, and the increase in the number of passengers does not tell the whole story of home some people perceive the increase in contrails. People had to get between cities before. But now they can do it in a more direct manner, and while doing that they leave regular contrails over regions of the county that might not have seen many before. And over regions that previously had air traffic overhead in only one direction, perhaps the opening of a new route will lead to occasional contrail grids, that might be new to the observer. If anyone has additional images that illustrate this, I’ve be very happy to add them to the article, or just add them in the comments here. Really good example of the old saying: “A picture tells a thousand words”. Evidence for “more flights” are not only seen in route increase and frequency, but in the ever increasing need to expand busy airports. in order to accommodate those flights. Here are some FAA historical forecasts on a variety of “air traffic increase” related subjects. I tried to find a good graph of airport increase and expansion….but could not….I gotta head to work now. Note how it’s almost all east-west traffic everywhere in most of the county. Contrail grids must have been quite rare back then. Stupid, thanks for the links on increase in flights, but this is more about increase in routes. 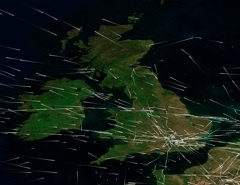 An increase in routes is more likely to cause someone to think that persistent contrails had “suddenly started”, whereas an increase in flights would just mean more contrails in areas where they existed before. 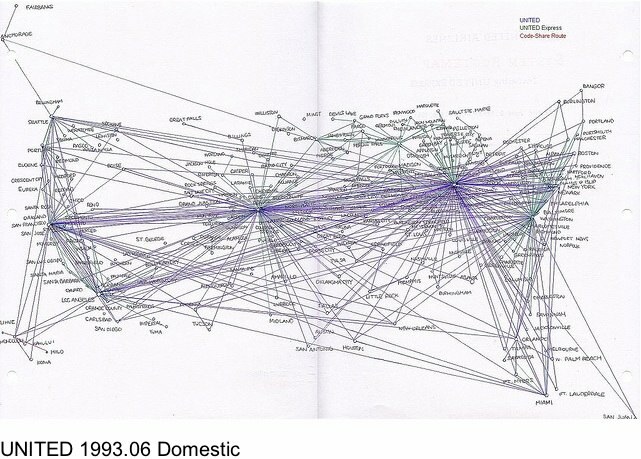 Deregulation of the European Union airspace in the early 1990s has had substantial effect on structure of the industry there. The shift towards ‘budget’ airlines on shorter routes has been significant. Airlines such as EasyJet and Ryanair have grown at the expense of the traditional national airlines. 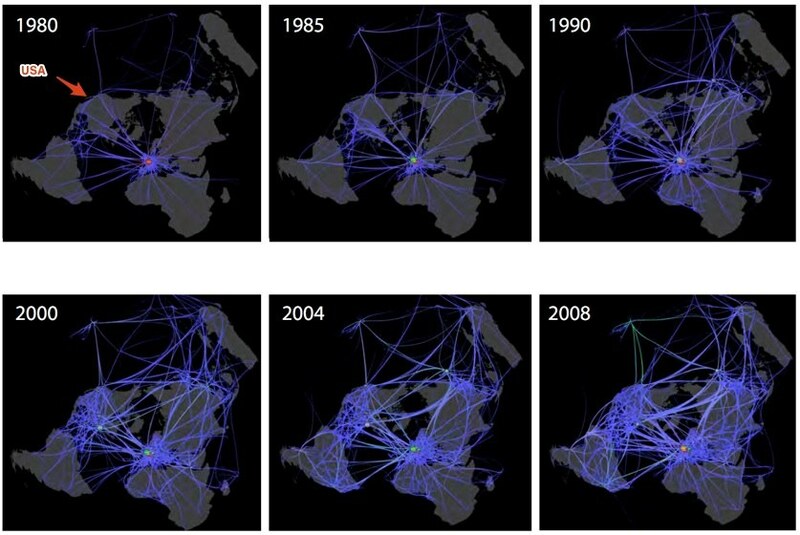 In the 1990s, “open skies” agreements became more common. These agreements take many of these regulatory powers from state governments and open up international routes to further competition. So it would seem that the decline of major airlines on fixed routes, along with deregulation, has led to smaller airlines flying more and shorter routes. So even if total air passenger miles had remained constant, there would still be millions of people who would start seeing persistent contrails where they had not before. 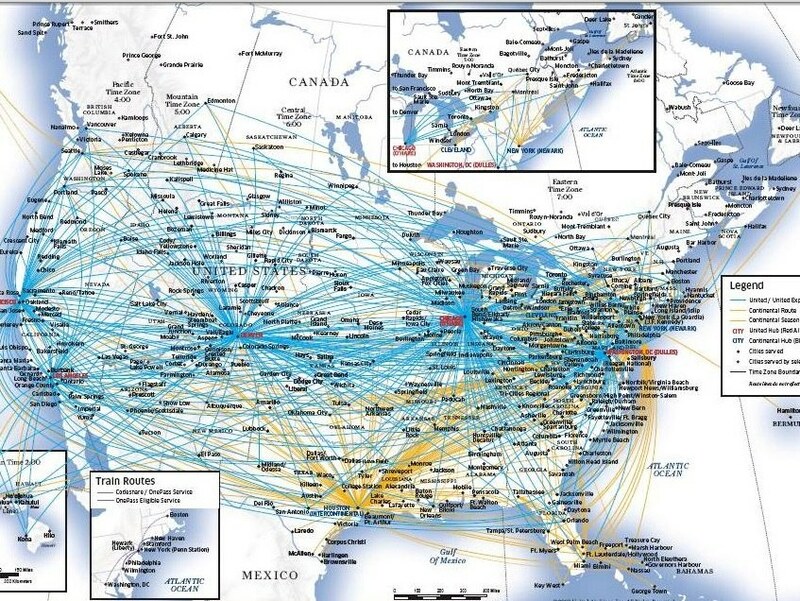 There are now direct flights to/from Denver, San Francisco, Chicago, Atlanta, Phoenix, Las Vegas, Los Angeles in addition to the original three cities. @ Uncinus; Dang it, man, thanks again. There is another, hidden variable – average humidity of air at the plane cruise altitudes – that may also have increased over the time. If so, this would account for longer contrail seasons, that is, for having more days per year when contrail persists. I wonder whether this have been researched, at least locally if not globally. As the persistence of contrail is merely an indicator of high local humidity, it would be possible to record the days when persistent contrails have been observed in a given area and to compare their yearly numbers over a period of time. Such a research could have been done already by processing satellite images or by ground observations. Are you aware of any publications on this subject? I don’t understand why the conspiracy theorists are concerned about the “chemicals goverments are spraying us” and not bothered by the pollution caused by the growing volume of contrails airplanes infuse in the atmosphere. Contrails contain all shorts of chemicals also, right? Yes….and, what’s more, the “normal” pollution from aircraft flying at high altitude (CO2, NOx, etc) is considered worse than the same amount of “normal” polution at ground level – in that it’s greenhouse gas effects may be 2-4 times as much. But apparently that does not actually bother them….it is hard to understand why they are so up tight about something there is no evidence for, and ignore something there is plenty of evidence for. Could you please direct me to articles about the actual pollution that results from jet fuel? Could you also dirct me to info about the rainbow seen around the sun at times when contrails have spread. I have seen this twice, after watching cloud development from contrails over a couple days. I do not recall seeing this in any other context. Are there other conditions when it is typical? Do you have info on that? For pollution, that’s a much larger topic, what did you want to know that Google can’t tell you? I took these pictures in Rome the last week, when a cirrus cloud past above the city around midday. This particular phenomenon is called circumhorizontal arc (see: http://en.wikipedia.org/wiki/Circumhorizontal_arc). It has nothing to do with pollution or contrails, as the cloud moved relative the sun, the rainbow arc moved from small wisps below to the cloud edge , so its visible part became longer. I should add, that on the day the contrail did not persist until shortly before the cloud arrived and ceased to persist as soon as it past a couple of hours later. Alexey, the ones I’ve seen look like this: http://www.atoptics.co.uk/halo/circular.htm I’ve noticed them since moving to an area with lots of air traffic. Uncinus, I must not know the right key words. All that comes up for me is the impact on global warming, mentions of toxic emissions, but no list of pollutants. Probably pretty typical of anywhere. I’ve seen those many times in different places all around the world. The °22 halo is probably the most common of this kind of phenomena, which are due to refraction of sun rays on ice crystals in the atmosphere. Water is its usual component, not a contaminant. This is why the recorded observations of these phenomena precede the first powered flight by centuries. It’s a pretty simple chemtical reaction, so there are not that many different pollutants. It’s mostly to do with the various quantities of the resultants. Thanks everyone for your links to emissions. I’ve lived in several northern places around the globe–none of them heavily polluted and most of them overcast– and haven’t seen this 22 degree aura before now. Possibly the lighter cirrus clouds from contrails are conducive for this aura. I lived in England for quite a while, and I don’t remember ever seeing one there. I saw one in California about 15 years ago, and now I see them ever few months (in California). I think that’s just me looking at the sky more here, but maybe also location does play a part – like maybe in the UK when the conditions are right aloft, then it’s also overcast below. I live in England for the past twenty years and see these 22 degrees halos a few times a year. Usually they are rather faint but, when atmospheric conditions are right, they are easy to spot if you look for them. The first halo I saw was a lunar one. I was about 7 or 8 years old. South Auckland, New Zealand. I had been sent out to the garage to get another box of fire wood. Full moon, high in the sky, massive halo! It scared me! I ran inside, terrified. I don’t recall noticing another one (solar or lunar) until after I started a career as a meteorologist. Now I look for them whenever I’m outside. I see several every year. Ross, I felt that way the first time I saw a parhelic circle around the sky! I was familiar with 22° halos, but that circle was huge and it freaked me out! But it did get me started on my hobby of learning about and photographing atmospheric optics. I do know one thing…once you’ve become interested and know when and where to look, you’ll see them all the time! Here’s my latest CHA, taken two weeks ago…number 20 for the last three years of watching! Can you please explain why the contrails in my area are only made by NASA planes that circle around the area for several hours a day. There are two airports that fly planes within my view, yet none of them leave contrails. Only the NASA plane that spends the day going on top of, and through clouds have contrails. Also, when they pass through the clouds, they turn a sickly orange. What is that? Also, the contrails will be pitch black at times. These do not leave trails – they leave little wispy black clouds. Oh, another thing, the plane is selective as to when it leaves trails and when it does not, even when seemly flying at the same altitude. It will have a contrail, then stop, then start up again. I have even seen them start producing a contrail while descending. I would love to believe that this is all just a misunderstanding – and if I had not seen and documented what I have observed, then I would absolutely believe that it’s just a case of mistaken identity. But I have hundreds of pictures of the NASA plane leaving trails and sudden atmospheric changes after they have laid down their trails. Sounds mostly like simple spatial variability in humidity, not just laterally, but vertically. These changes in background conditions allow contrails to persist or dissipate – “start or stop” – as the plane travels along. The other point about the NASA plane you mentioned could just be the higher “Contrail Factor” of that particular aircraft. This factor describes the amount of water produced (as a by-product of combustion) by a specific engine type, and hence the likelihood of it leaving a trail; more water means it produces a persisting contrail in a wider range of conditions. Pictures would certainly help clear up any confusion, and ensure we’re discussing the same things. Seriously though- Unless you could somehow visually track that particular NASA plane from takeoff to altitude how do you know it’s a NASA plane? I know of one NASA base in Houston where they keep two “atmospheric research” aircraft that are capable of reaching U2 altitudes. In fact they are often cleared above FL600. These planes would be very difficult to see even with high tech equipment. Othere NASA type aircraft could be trainers which would not behave in any way like other aircraft so it would be easy to witness changes in contrail behavior based on the fact that those training aircraft are constantly changing altitudes/power settings etc. the 10″ telescope in his setup retails for $600 in the USA – so not all that expensive either. Well I guess I assumed that since these atmosheric planes were once used for spying they would be difficult to spot by the normal person with regular equipment. I didn’t consider nerds. became a Commercial pilot in 1967. I strongly disagree with this site. But people can either gather all the info on this topic or jump on this wagon. But this site will find many to agree with them. Wisdom should cause you to search for facts. But what will you do with the truth if you find it? Ed, what exactly is it here that you disagree with? Ed, I agree with you that the tens of thousands of pilots and other air crews fly the exact same airspace as the contrails people are calling chemtrails. None of them see any unidentified planes spraying, quite a few of them agree with this site and visit here regularly, and none of them believe in chemtrails. There is NO movement of pilots or aircrews who are pushing the chemtrail bandwagon. What does that tell you? You should answer Uncinus’ question. Does anyone actually believe that “Ed” will return?